Teachers are Dave Bing, Kate Lissauer, John Whelan, Rose Ardron, and others TBC. Classes are in fiddle, banjo, guitar, part singing, and beginners instrumental (all instruments). 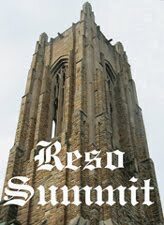 A week of intensive fun and wall-to-wall learning in a beautiful environment, accompanied by Olympic-sized food, delicious swimming pool, friendly teachers, and accomplished friends. £550 includes all amenities, food and room, tuition, and facilitation of all transfers. For information and enrolment, contact Kate Lissauer by e-mail or 'phone (+44 (0)1373 474 110). More details are on the 'Events' page of Kate Lissauer's website. The 'Media gallery' section includes many photos taken during previous workshops. Matt, a double-bass player originally from Texas and now living in Brussels, Belgium, sends word by e-mail that he is looking for a banjo player to join his band, and would be glad of advice on how to find someone. As the system through which the European Bluegrass Blog (EBB) receives e-mails has been cunningly devised so that the sender's address is not shown, we can't send Matt a direct e-mail reply. We can, however, give him through the EBB the assurance that there are banjo-players somewhere near him; and his best bet for finding them is through the Bluegrass in Belgium website - either through its mailing list page or by e-mail. 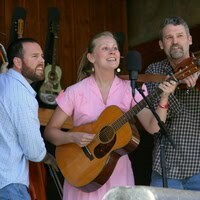 We'd like to let you know about our French Bluegrass group! 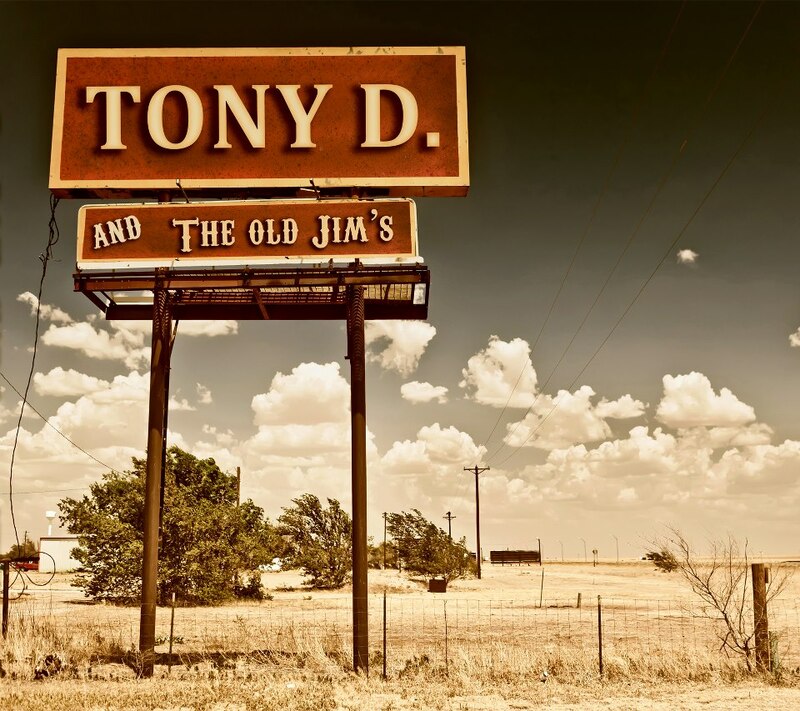 Inspired by bluegrass, folk, and rock, the Dijon-based Tony D. & The Old Jim's feature Anthony 'Tony D.' Doiret (guitar, dobro, harmonica, vocals), Laurent 'Wolver Jim' Decornoy (banjo, bass drum, vocals), Marven 'Hairy Jim' Osta (bass, vocals) and Jérôme 'Jerry Jim' Séquin (guitar, mandolin, vocals). 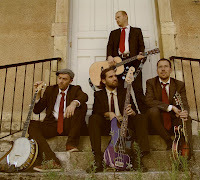 Using usual bluegrass instruments, which are quite atypical instruments in France, the members of Tony D. & The Old Jim's sing lead and backup vocals, play bluegrass, Americana and old-time standards, but also original songs composed by Anthony Doiret. The foursome started playing together in 2010, having their first show on June 2011, leading to their first self-titled debut album in October 2012. It can be ordered on their website. You can also find them on Facebook. 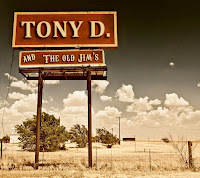 Feel free to ask us more about us, and if you'd like to get a CD, please let us know where to send it! Thanks and see you! 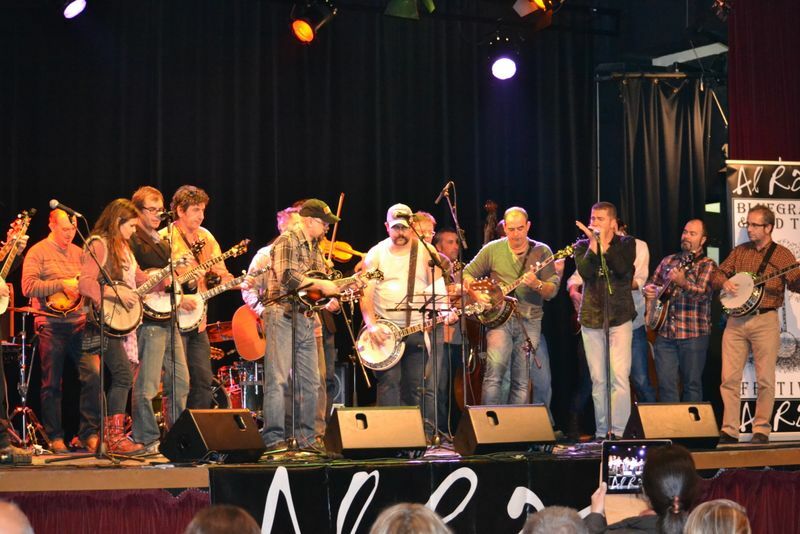 Rainer Zellner and his Music Contact team send the latest news on tours by bands in bluegrass and related music in the updated November Music Contact newsletter. 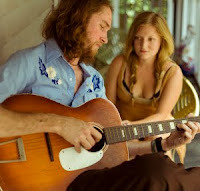 Further info on artists, and video previews, are on the Jamboree! website. Farewell blues is the new CD from the Leon Hunt n-Tet. 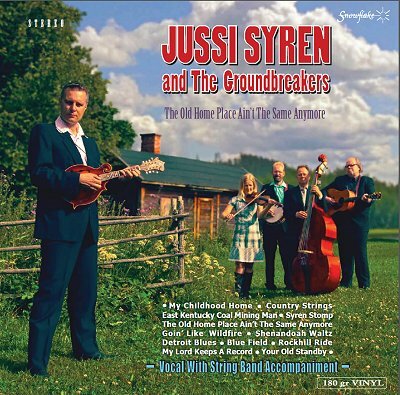 The album is a celebration of the life and music of Earl Scruggs and other first-generation bluegrass musicians. To support the release, we are giving away copies to two lucky readers. To stand a chance of winning one of the copies, all you have to do is register with your e-mail address. 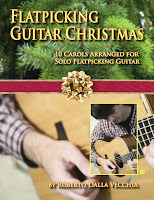 You can enter UKBluegrass's giveaway here. The winners will be chosen on 1 December 2012. 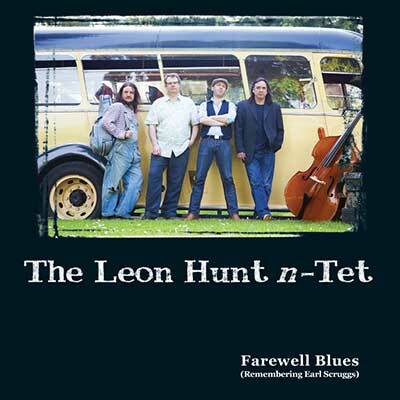 The draw is open only to UK residents, so for online purchase of the album go to the Leon Hunt n-Tet website. This is a St Andrew's Week special which contains material by Scottish artists or artists with Scottish ancestry; as well as one which sticks out 500 miles and was written by the Proclaimers. 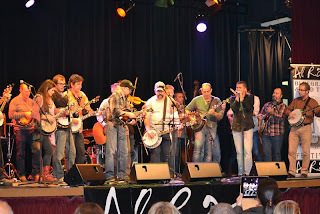 Wayne Taylor and Appaloosa performed it in Moniaive and that makes it a must for the show! 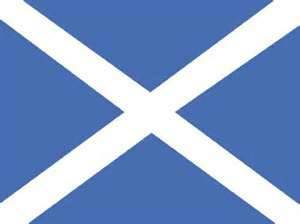 Have a great St Andrew's Day on 30 November. Earlier this week Paul posted a large number of photos, taken at this year's festival, on the Moniaive Michaelmas Bluegrass Festival website. And if you're in Barcelona and you need anything, go to Guitarland shop, the bluegrass centre. 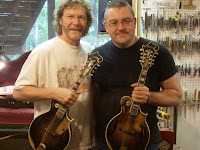 There you can find Richard da Silva, one of the owners and a bluegrass player. 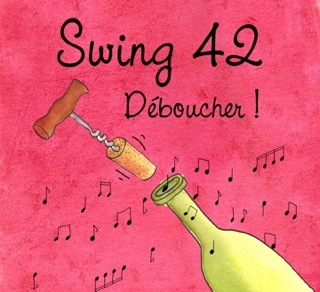 Thanks to Lluís Gómez in Barcelona for news of his new acoustic quartet Swing 42, playing manouche, bluegrass music, and beyond - or 'gypsygrass and blueswing' - and their new CD, Déboucher!, released by Red Pig Recordings. 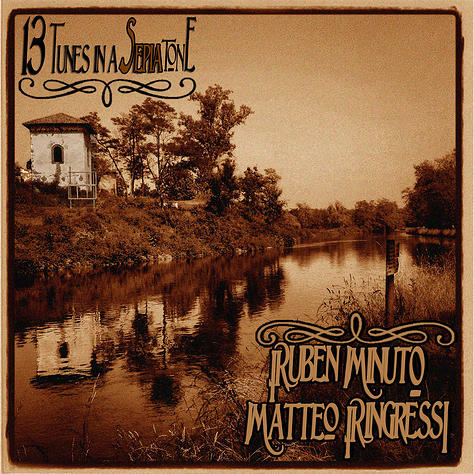 Swing 42 consists of Lluís (5-string banjo), Valentín Moya (Manouche guitar), Oriol Gonzàlez (mandolin), and Maribel Rivero (upright bass). The eleven tracks on Déboucher! include original compositions by Gómez, Moya, and Gonzàlez, Mozart's 'Turkish march', David Grisman's 'Dawg's bull', Bill Monroe's 'Jerusalem Ridge', 'Farewell blues' (brought to bluegrass by Flatt & Scruggs), and more. It can be heard and bought at Cd Baby, and is also available at two Barcelona stores: L'anima del vi and Guitarland. The Swing 42 website includes a video of the band in performance at the 22è Festival Reus Blues, and an introduction by French banjo maestro Jean-Marie Redon. Lluís Gómez reports from Spain that the 11th Al Ras Bluegrass & Old Time Music Festival, held at the Mercat Vell de Mollet del Vallés, Pça Prat de la Riba 6, Mollet del Vallés, Barcelona, on 10 November 2012, was a great success, attracting plenty of people including new people interested in bluegrass and old-time music. Lluís also sends this link to an album with scores of photos taken at the Festival, both on and off stage. The photo below is one of many showing the Festival finale with all performers on stage together. 'Foggy Mountain breakdown' was played, in tribute to Earl Scruggs. Although the bio page on Lluís's website identifies him as 'one of the few musicians dedicated completely to this magnificent instrument [the banjo]', he can also be seen playing fiddle in some photos. Next year's Al Ras Festival will be held on the second or third Saturday of November 2013. Details will be announced as soon as possible. After the unforgettable double show of Blue Highway we prepared the next extraordinary concert - three excellent American bluegrass bands in one evening - Audie Blaylock & Redline, Bearfoot, and Caleb Klauder & Reeb Willms. The concert takes place in the congress hall of the Pyramida Hotel in Prague, on Tuesday 4 December, 8.00 p.m. More information is here. 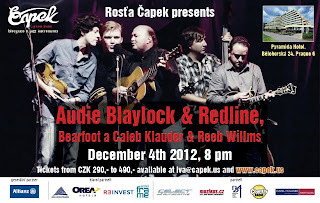 Tickets (from €12 to €22) available at iva@capek.us. Accommodation for a special price in 4* hotel Pyramida (€25 in double room with breakfast) on request. We are looking forward to you. The Prague concert is part of the tour schedule of the 4th Bluegrass Jamboree!, arranged by Rainer Zellner and his Music Contact agency. Caleb Klauder & Reeb Willms are playing several dates in Denmark before joining the Jamboree. I have always loved Christmas music. In fact, my CD collection of holiday music is growing year after year. There is nothing better than listening to a good Christmas CD to put me in the right mood for the holiday season. 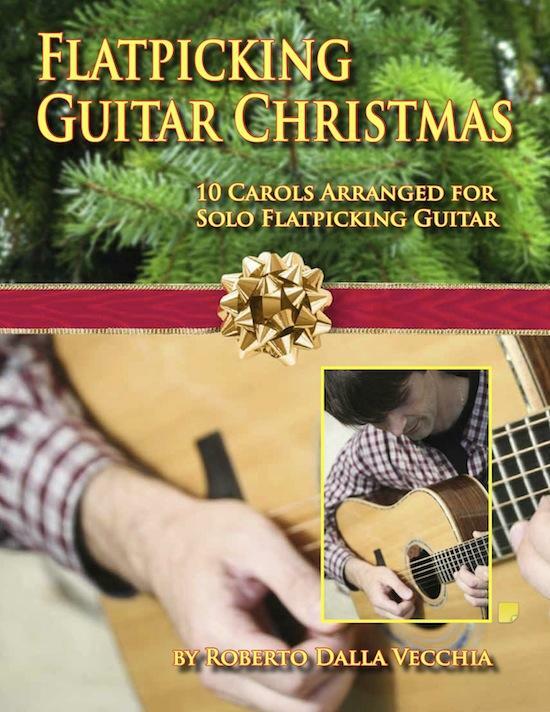 That being said, I love the challenge of playing flatpicking guitar without a backing band, and that is what motivated me to write this book. Click here to learn more and to see sample pages. 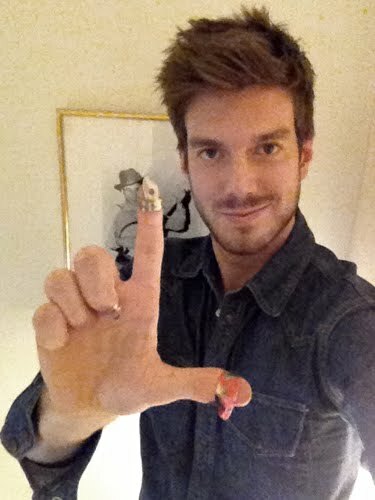 Roberto's complete e-newsletter can be seen here, and upcoming shows from 23 Nov. can be seen on his online calendar. 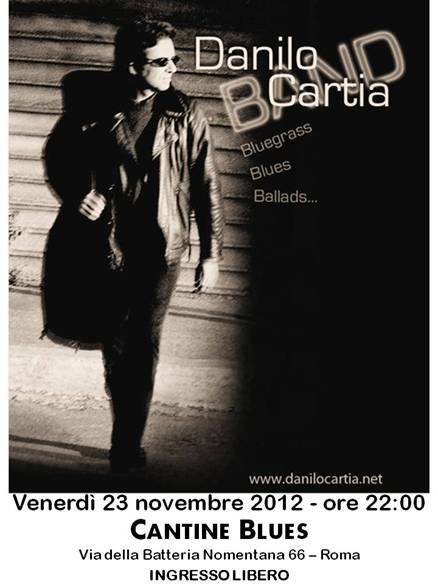 Banjoist, guitarist, singer and bandleader Danilo Cartia (I) announces two performances in Rome in the coming weekend: with the Danilo Cartia Band at the Cantine Blues, Via della Batteria Nomentana 66, on Friday 23 Nov.; and with Letizia Sampaolo (guitar, autoharp, ukulele, and vocals) at the Charity Cafe, Cia Panisperna 66, on Saturday 24 Nov. Both shows begin at 22:00, and admission to both is free. Be the first to watch our new video to the song 'Walkin’ after midnight', from the album Swings & heartaches; more on my website. 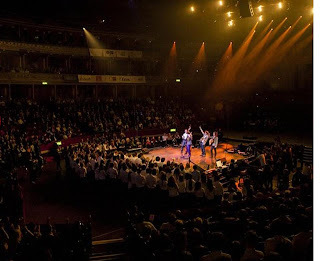 Flats and Sharps, the young favourites of the British bluegrass scene, performed at the Royal Albert Hall [above] last weekend as part of the Schools Prom promoted by Music for Youth. 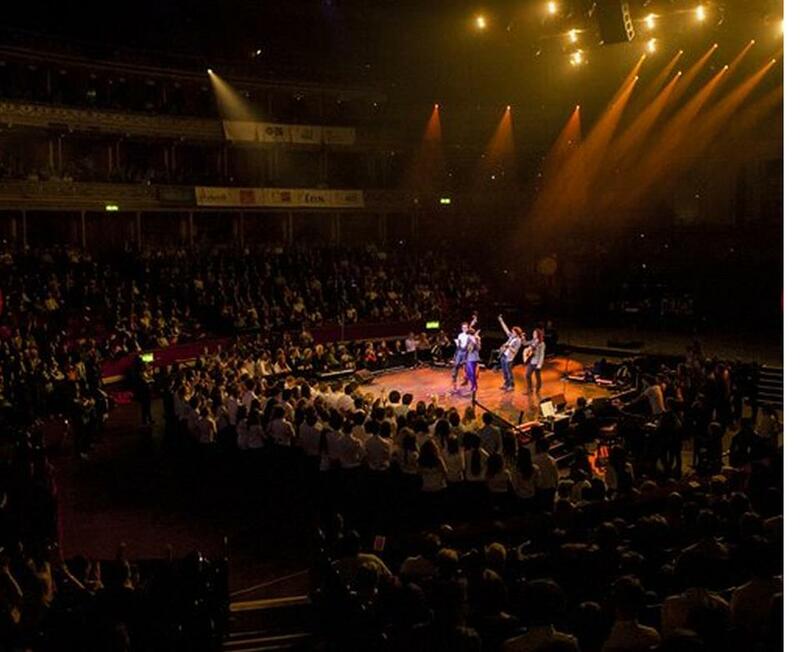 Radio station Classic FM were involved and posted several video clips on their website. Might be that the band charmed the pants off the presenters…. You can see the clips by following this link, worth a look! The band have had quite a year, releasing their first CD, Proper job, and playing numerous festivals, the highlight of which was the Didmarton Bluegrass Festival, where they were invited to join legend Peter Rowan on stage! 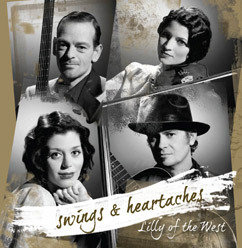 Just prior to their Royal Albert Hall appearance, they had travelled to the centre of France to play the France Bluegrass Musique Association festival in Vichy. 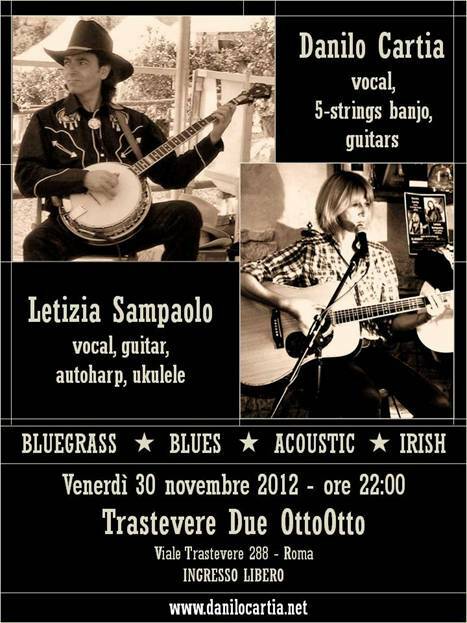 Despite their youth, the band play bluegrass in the traditional style and perform mostly self-penned material. Their ability is something to be seen and the band have that essential vocal element, full three- and four-part harmony singing. 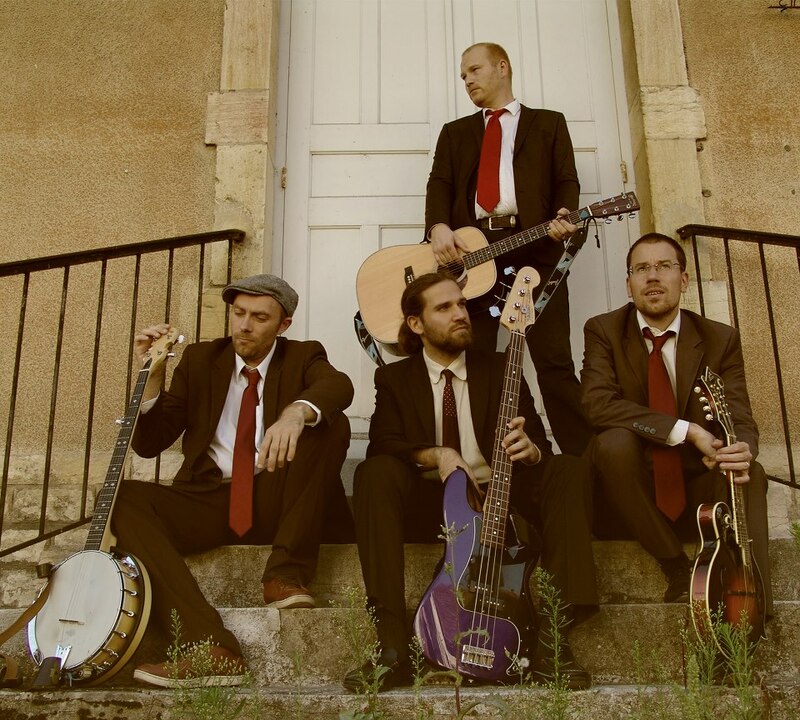 If you are lucky enough to live down in far West Country, you can see them regularly playing at different venues around the county of Cornwall, but it shouldn’t be long before these lads are gracing the stage of folk and acoustic music festivals all around the country. As they move into 2013, they are planning their next album and are already filling their gig calendar with some prestigious gigs! Follow them in all the usual places - but a good start is their website. 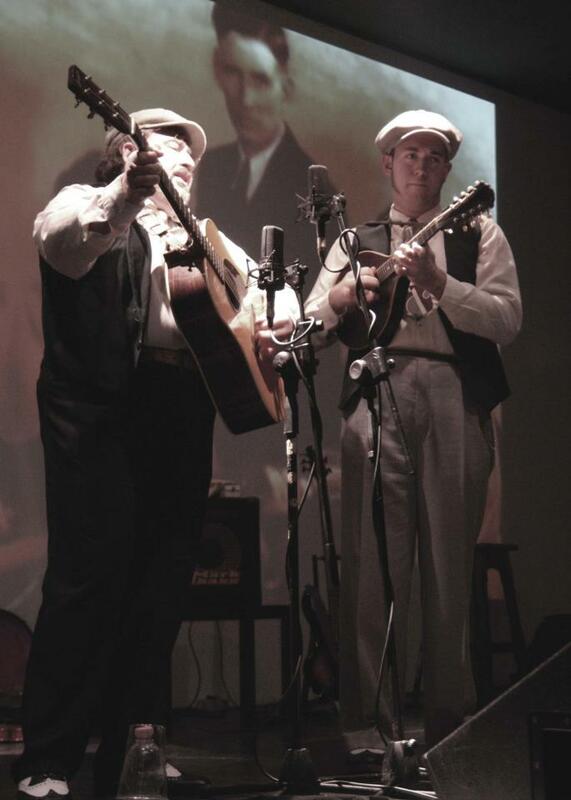 John Lawless reports on Bluegrass Today that in the popular US TV series 'Glee' the episode broadcast last night (15 Nov.) featured the sound of the banjo, played by Jens Koch (left) from Sweden's award-winning G2 Bluegrass Band. However, the picks shown in the photo did not take part in the show. As Jens himself explains on Bluegrass Today, the show's producers wanted a plectrum-banjo sound - and, with the real bluegrass spirit, he did what had to be done. Note the picture on the wall behind him, and read the full story here. 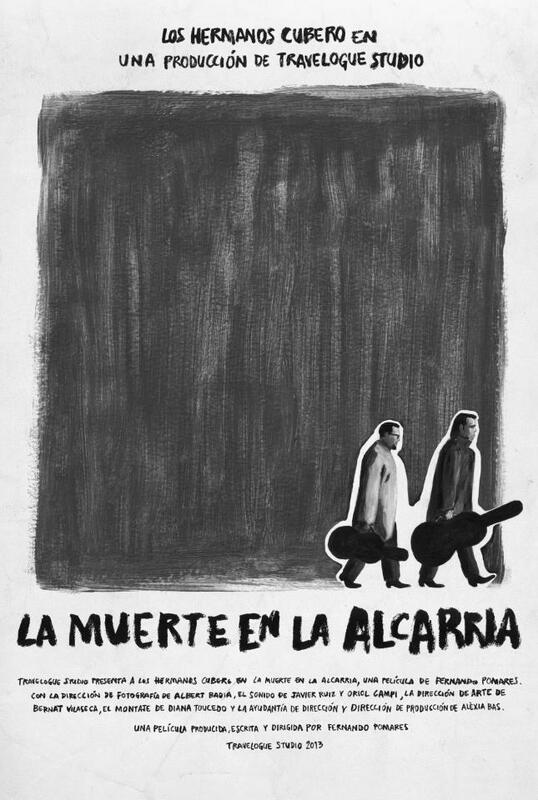 Thanks to Roberto of Los Hermanos Cubero in Spain, who sends news of the Travelogue Studio production La muerte en la Alcarria, a film produced, written, and directed by Fernando Pomares. Los Hermanos Cubero appear in the film, a trailer for which can be seen on Vimeo here. Roberto also sends the poster image (left), which creates a sombre atmosphere to match the film's title. Update 15 Nov.: More details of the film appeared yesterday on Bluegrass Today. Onwards & upwards, the new Pinecastle Records album by Irish singer, songwriter, bandleader, and broadcaster Niall Toner, is at the #1 position on the AirPlay Direct (APD) all-genres Top Fifty radio download chart today (12 Nov. 2012). It is also at #23 in the all-genres APD all-time Top Fifty Albums chart, and at #22 in today's APD Bluegrass/Folk Album Radio Downloads chart. The album, of which details have already appeared on the EBB and the Bluegrass Ireland Blog, is now available in all formats. 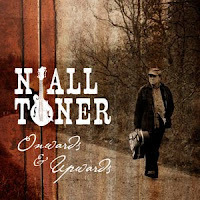 Signed copies can be ordered through the Niall Toner Band (NTB) website; tracks and/or the full recording are available from iTunes; and CDs are available from Pinecastle Records and from Barnes & Noble bookstores throughout the USA and Canada. Niall Toner and the NTB are exclusively represented worldwide through the Make Welcome music agency. The Athy Bluegrass Festival in Athy, Co. Kildare, was founded in 1991, making it Ireland's oldest annual bluegrass event. Tony O'Brien (shown left; photo by Carl Mark O'Neill), who has been its organiser since 1997, has now decided not to continue the festival after this year. His announcement can be seen on the Bluegrass Ireland Blog. As well as maintaining the Athy festival's role as a 'home town' and showcase for Irish bluegrass bands, Tony has presented many excellent acts from the USA and Europe, including the Bluegrass Patriots, High Country, High Plains Tradition, Ross Nickerson, Special Consensus, Pete & Joan Wernick, the Blue Grass Boogiemen, 4 Wheel Drive, Andy Glandt, Monogram, and Red Wine. ... but only so that she can go back in and show an H&M camera crew around. The former Bearfoot lead singer (seen on the right with her new band, the Bootleggers) has a passion for vintage clothing and runs her own blog on the subject. On Bluegrass Today, John Lawless reveals how this attracted the attention of the Sweden-based fashion chain, which has featured her on its video channel. Full details, including the H&M video, can be seen here. Francophone lovers of fiddle-driven, blues-infused music from the rural American south will be glad to hear that the Grammy-award-winning Cajun band BeauSoleil avec Michael Doucet, 'the best Cajun band in the world', has joined the artist roster of the Nashville-based independent roots-music label Compass Records. 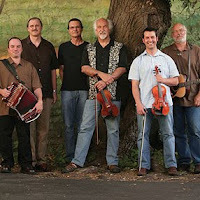 Michael Doucet has already taken part in a Compass project - the album Fiddlers 4 with Darol Anger, Bruce Molsky, and cellist Rushad Eggleston (2002). The band have begun work on their debut Compass album, From Bamako to Carencro, scheduled for release early in 2013. This move continues the long tradition of Cajun contribution to recorded country music. Read the whole Compass press release here. In an earlier post on EBB this week, we learned of the Dopyera Brothers' historic instrument and workshop collection being sold at Christie's Auction House in New York City. Also of worthy note (at the same auction) is the sale of music legend Doc Watson's 1968 Gallagher G-50 Guitar, which he called "Ol' Hoss". His familiar guitar strap (with his name engraved on it) is included with the infamous guitar, along with other personal items. 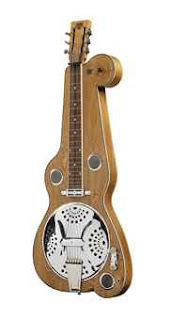 This is the guitar Doc used on the 1972 "Will The Circle Be Unbroken" 3-LP set by the Nitty Gritty Dirt Band. 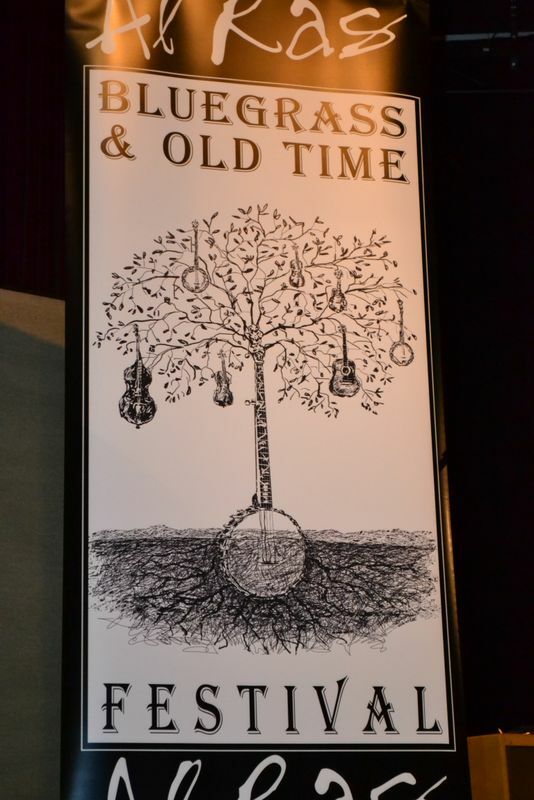 Doc's old companion was previously on display at the Country Music Hall of Fame in Nashville, Tennessee. In 2008, the guitar was returned to its original home at J.W. Gallagher's Guitar Shop in Wartrace, Tennessee. The auction will be November 27, 2012 beginning at 10:00am Eastern Standard Time. A great new EPK (electronic press kit) is up and running on the Foundation for Bluegrass Music's website. Basically it is a short six-minute video highlighting the Foundation's purpose and goals. I am proud to have helped with this project and also proud to have Molly Tuttle included in it, along with the Tuttles, and A.J. Lee, and a host of other notable musicians. Please take moment to view and learn more about the Foundation's important work. Consider a donation and enjoy the video! The video highlights the work of the Foundation in helping younger musicians. Among those shown performing are a European band, the Toy Hearts (GB). 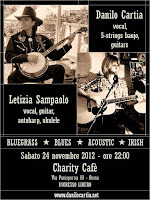 Details are also given of the Foundation's 'Bluegrass Innovator' grants programme for 2013. 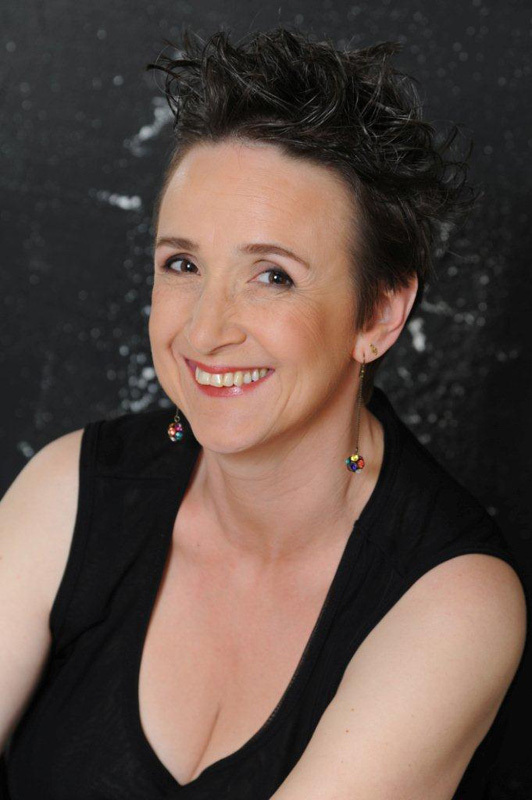 We have a pretty high-profile lineup of tutors, from the legendary Fletcher Bright, who put the Sore Fingers Fiddle course on the map back in 2001, to the incredible singing talent of Mollie O’Brien and her partner Rich Moore. Add a few amazing characters like Noam Pikelny, Chris Eldridge, and Dirk Powell to the mix and we’ve probably got one of the best lineups of musicians to teach you next Easter. There’s no need to contact us to check for availability. Please download the form and send it in with deposit. Forms available from this link. More information here. While getting ready to host Peter Rowan for its 4th annual Bluegrass Party on 16 November in Genoa (Genova), and for a few more gigs together in Turin (Torino) 14/11, La Roche-sur-Foron (FR) 17/11 and Milan (Milano) 18/11, Red Wine has just released a new video clip on a beautiful song from the late Liz Meyer, 'Someday you will', which appears on the band's latest CD, RED, released earlier in 2012. The band photo above (l-r: Lucas Bellotti, Martino, Silvio Ferretti, Marco Ferretti) is from the back cover of RED. 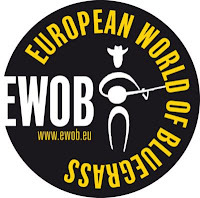 Today (6 Nov.) is the birthday of Angelika Torrie, treasurer and webmaster of the EBMA, editor-in-chief of the EBMA's official magazine, Bluegrass Europe, and formerly (2009-12) EBMA chairperson - not to mention her work over a longer period for the Swiss Bluegrass Music Association and, more recently, the German Bluegrass Music Association. To mark the occasion, Bluegrass Today carries today a major feature by Richard Thompson, incorporating a long interview with Angelika - an adaptation and update of a profile written for Bluegrass Europe # 75 (Aug./Sept. 2010) - which can be read here. Resophonic instruments may be more popular at present than at any time since they were invented and developed in the 1920s by John Dopyera (1893-1988) and his brothers, originally from Slovakia. 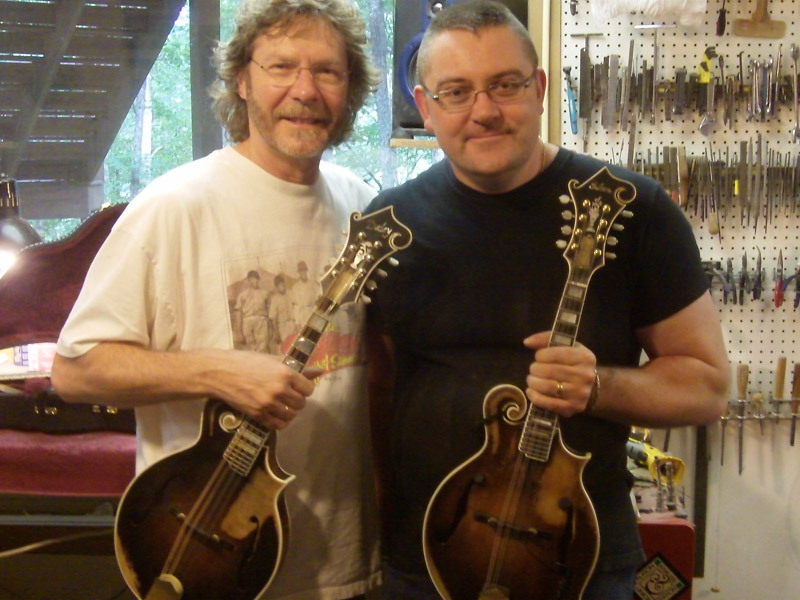 Since John Dopyera's death, his son Dr John E. Dopyera has sought for a museum that would be interested in purchasing and displaying the collection of instruments from the last shops of John and Rudy Dopyera. These instruments, along with other 'last shop' furniture and artifacts, were exhibited in Syracuse in 1988 and at the Erie Art Museum in 2000. Revenues from the sale will be distributed to the grandchildren of John Dopyera (as per his wish). The auction can be watched live on Christie's website by viewers who register to do so. Arrangements for online bidding need to be made before the sale. Thanks to members of the bluegrass community for passing on this news, which comes from Mrs Margaret Lay-Dopyera, wife of Dr John E. Dopyera. The EBB adds that her memoir My life as a Dopyera is available from Elderly Instruments and Amazon. Thanks to Oliver Waitze of the New Acoustic Gallery (NAG) in Germany, for the NAG's November 2012 newsletter, which can be downloaded as a pdf format document, or viewed on the news pages of the NAG website. The seven-page newsletter includes details of new products in stock, including the new Eastman MD 315 F-style mandolin. 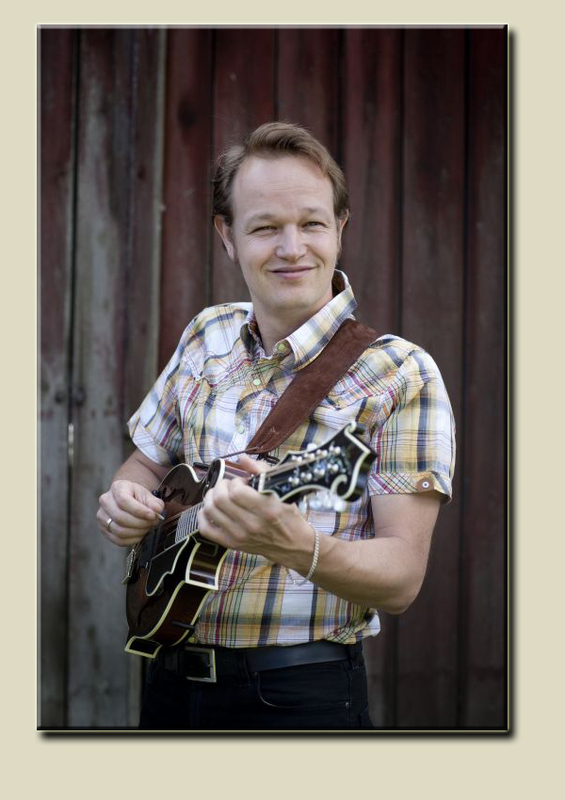 On the weekend 17-18 Nov. the NAG is hosting a mandolin weekend workshop by Jesper Rübner-Petersen (see photo), who will also be taking part in a concert with the Trio Vibracao. Full details are on the NAG website. These will be the last events at the NAG premises in Solingen, where it has been for nine years. After 24 Dec. 2012 the NAG will be based from January 2013 in a prestigious new location, the Schloss Lüntenbeck in Wuppertal. Read the whole newsletter here. Welcome news from Stergios Loustas, representing a group of enthusiasts in Greece who have decided to create the Greek Bluegrass Music Association.The Association's website is already under construction, and its members are keen to become part of the European bluegrass family. Anyone in Greece who would be interested in joining - and anyone outside Greece who wishes to assist the new Association - can contact Stergios by e-mail. 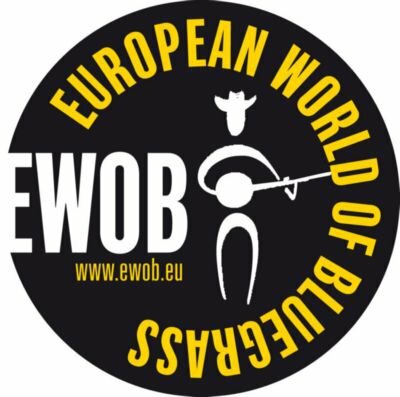 The organising committee of the European World of Bluegrass (EWOB) Festival, held annually in the Netherlands since 1998, announce that the time has arrived for bands to send in applications to play at EWOB 2013, which will be held on 9-11 May 2013 at Voorthuizen. 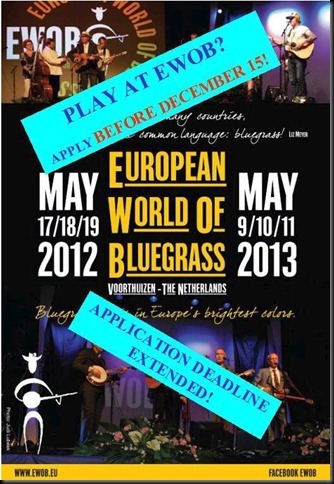 The deadline for sending in applications is 1 December 2012. Full information on applying to play is here, where you can also notify the committee that an application package will be sent, and download a printable application form.